Looking to explore more of Bath? 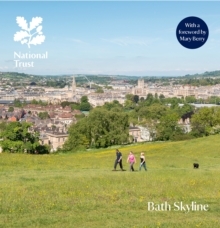 The Bath Skyline guidebook provides detailed instructions to walks within the boundaries of the UNESCO World Heritage site - but which feel miles away from the hustle and bustle of the city centre. `Walk to the View' guides you from the city centre to Bathwick Fields, revealing more of the city's history en-route. The stunning six-mile Bath Skyline route traverses the countryside framing the south-east corner of Bath, and rewards you with spectacular views of the city below. There is also a map for the two-mile Family Discovery Trail at Claverton Down, most of which is pushchair- and wheelchair-friendly. Each section provides a map, clear and detailed instructions for the walking route, and information about the history, flora and fauna of each area as you explore it. Discover where distinctive Bath stone was once quarried, the sites of deadly duels and where to spot jays, red kites, multiple species of butterflies and much more. There's also an introduction to Bath's long history, including stories about key figures who shaped and lived here such as Ralph Allen and Jane Austen, while a foreword by Mary Berry highlights what makes Bath so special and beloved by locals and visitors alike. Packed with gorgeous photographs and illustrations, this practical guidebook will appeal to anyone looking to explore more of Bath or looking for an attractive souvenir of their visit.